E-cigarettes and other vaping products are on track to out-sell cigarettes by the end of 2023. And more and more young people are trying e-cigarettes. So what do you need to know about them? Are they less harmful than using cigarettes or other burned tobacco products? First, they are not burned tobacco products. Most often, they contain nicotine solutions that are heated to make a vapor (hence the terms vape or vaping), and they’re usually powered by batteries. Some look like cigarettes and others can resemble flashlights. The first e-cigarettes were not produced by cigarette companies, but the cigarette companies have gotten into the business. E-cigarette and vaping products are available in specialty stores and convenience stores around the US with varying restrictions on purchase by youth under 18. E-cigarettes don’t necessarily contain nicotine. Some popular products contain little or no nicotine and levels can vary from brand to brand. And nicotine isn’t always the reason someone might try e-cigarettes. In Canada – where nicotine-containing e-cigarettes are not approved, but still widely available – only 38% of adult cigarette smokers who also use e-cigarettes “always use nicotine” and 30% “sometime use nicotine” when vaping. And only 4% of those who never smoked tobacco reported using nicotine when vaping. A 2014 national high school survey finds more monthly vapers than monthly smokers: 17% of US 12th-grade students report using e-cigarettes in the past 30 days compared to 14% for tobacco cigarettes. We also know that patterns of infrequent, non-daily use of various tobacco and nicotine products may be increasing among young people. But trying e-cigarettes does not automatically lead to daily use. Young people might also be influenced to try e-cigarettes because of how they are priced and promoted. They can be cheaper than traditional cigarettes and may be perceived as safer. Other features, like flavors can also support use in all age groups. As e-cigarettes become more popular and more visible, young people will start trying and using these products. And because products keep changing, they will often try different kinds of e-cigarettes. Youth is a time when individuals experiment with and get into trouble with psychoactive substances, including nicotine-containing e-cigarettes. In 2014, 44.4% of 12th-graders had ever used marijuana/hashish, and 35.1% had used in the past year; 41.4% reported being drunk in the past year. Users of one type of psychoactive substance are more likely to use others, like caffeine, alcohol, nicotine, THC or prescription drugs. Recent reports suggest that vapers should be cautioned about how they use high-voltage devices because they can produce high levels of the carcinogen formaldehyde. But that, however, is not one of the common ways people use e-cigarettes. High voltage devices and long puffs can produce a bad taste that is avoided. Burned cigarettes contain many carcinogens: the FDA lists 79 “harmful or potentially harmful” carcinogens in tobacco products and tobacco smoke. Keep in mind that reports of a product being “not safe” in some way does not necessarily mean that it cannot overall be much safer than another product. The specter of some drugs being gateways to more dangerous drugs has preoccupied drug policy, and this is no different when it comes to tobacco products. 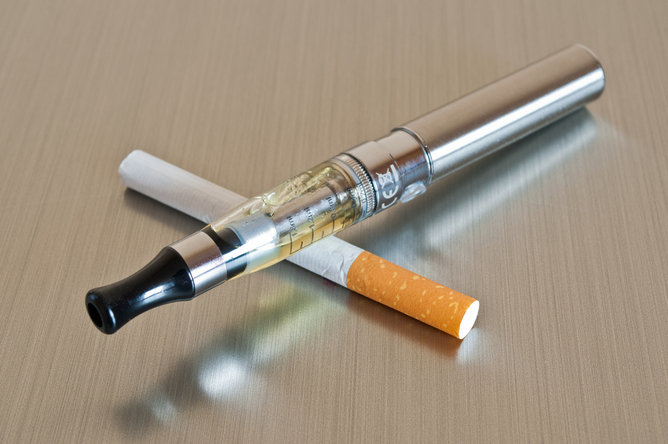 E-cigarettes have been feared as possible gateways to cigarettes. If vaping has been acting largely as a gateway to cigarettes, one would expect to see more cigarette smoking with the rise in vaping. This has not happened. Smoking has continued to decline. Cigarette smoking by young people is the most powerful cause of smoking by adults. In a broad sense, the world is full of products that can look like gateway products. The use of BMX bikes on dirt tracks by children could be gateways to the use of motorcycle dirt bikes by adults. But do the products cause the linkage or are individual tendencies more responsible for associations? Much research on drug gateways supports a “common liability model” more than drug-based causal models. The Common Liability Model holds that characteristics (for example, liking to take risks) within individuals can be responsible for drug-use associations. No matter whether you think (a) that trying of an e-cigarette is a causal gateway to later smoking that would not have otherwise happened or (b) that those who are more likely to try cigarettes are more likely to try e-cigarettes, once products become available to users, how these products are marketed influence which products are preferred. What is said and done about vaping can promote gateways to cigarettes. If you show more concern about vaping than smoking or if you downplay the deadly risks of smoking, you encourage young people to switch to cigarettes. The policies that allow certain substances, like alcohol, tobacco and psychoactive substances, to be used quite freely by adults usually include prohibitions on use or purchase by youth. Without such policies, there might be even more experimentation by youth with these products. Prohibitions on sale of vaping products to youth should be supported. If you are faced with committed teenage smokers (who are probably also using other prohibited substances like drugs or alcohol), perhaps the best you can do is foster switching to e-cigarettes. Of course, do explore their interest in getting help with quitting smoking from quit-lines. For less-involved users of e-cigarettes who do not smoke regular cigarettes, encourage that regular use be avoided and that nicotine use be limited as much as possible. Telling a teenager that vaping is just as bad for you as smoking or that e-cigs are worse than tobacco cigarettes could push them toward cigarettes and is not justified. It makes more sense to tell a young person that it is much better for their health if they stay away from tobacco cigarettes or cigarette-like tobacco cigars completely. This article has been updated to correct mortality data for smokers. How can smoking be reduced?